The future of government and democracy arguably hinges upon successful adaptation within an increasingly networked environment both digitally and socially. 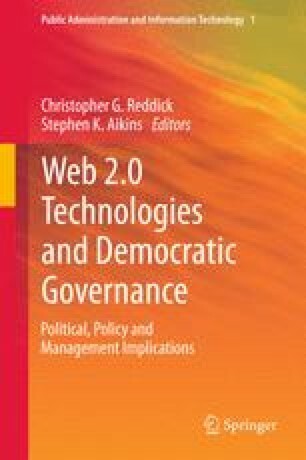 The purpose of this chapter is two-fold; first, to sketch out the main structural and cultural tension points between the Westminster model of democratic governance and emerging contours of Web-2.0 stylized reforms associated with likeminded discussions of Gov 2.0; and second, to examine recent reforms in Canada and elsewhere and their potential to resolve such tensions. The overarching challenge of social media and democratic governance is shown to be the need to overcome the inertia of secrecy and to foster new and more flexible information, knowledge, and learning architectures for the public sector as a whole. Williams, A. D. (2008). Government 2.0: Wikinomics and the challenge to government, Canadian Government Executive (Ottawa, www.netgov.ca).